Amangiri is one of the most unique and incredible resorts I have ever experienced. 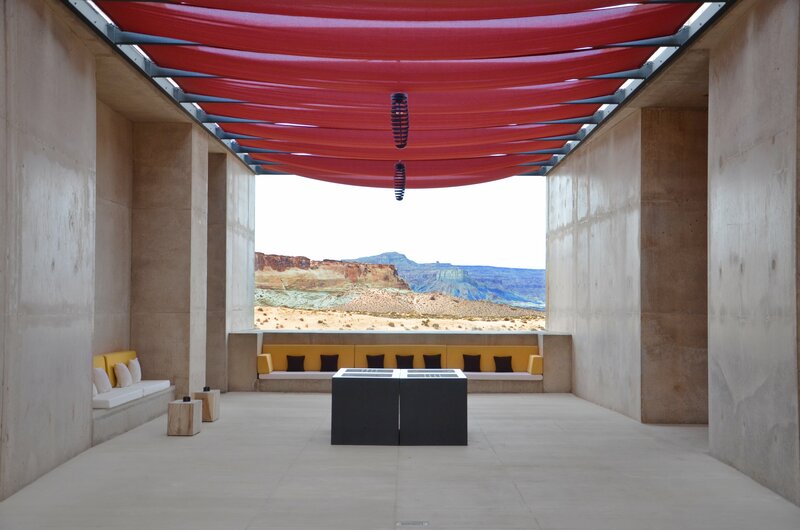 Amangiri, meaning peaceful mountain, fully lives up to its name. If you don’t leave this resort completely rested and decompressed after staying here then check yourself into the closest mad-house because there’s no hope for you. This resort is located in a remote area called Canyon Point, Utah approximately a 25 minute drive to the closest town of Page, Arizona which hosts the nearest airport. I purposefully flew into St. George to see that area, and then made the several hour drive to Amangiri taking me past Zion National Park (an incredible sight to see) and I found the experience to be a pleasant drive. The resort entrance sign is fairly discrete and I actually passed it on my first try. When I made the correct turn off the main road, I drove a short distance and then came to a very nondescript cattle gate where I had to buzz the front desk. For a split moment, I wondered if I was at the right location, and if I was, had I made the right decision to stay here. And then, the gate opened (this was eventually referred to as the gate to heaven)….I followed the winding road through an amazing sandstone canyon that was a jaw-dropping sight. At this point I hadn’t even seen the resort, but it didn’t matter, I was right where I was supposed to be. This very small, secluded resort is designed to blend into the natural landscape by utilizing an earth tone color palate, clean lines and incorporating the extraordinary landscape as the main attraction. Simplicity and clean lines define this resort. The indoor/outdoor living concept expressed throughout the resort fully engages your senses and connects you with the spirit of the environment. When I finally crested the canyon, still speechless from the beauty I had just witnessed, I arrived to a staff line-up waiting to greet me (just like in those period movies where the rich owner drives up and his staff is waiting to greet him). Talk about feeling special! I was greeted by name, they immediately acknowledged a birthday celebration and then I was whisked up to the reception desk and checked into my room effortlessly. This intimate property of only 34 units offers each guest a contemporary room designed with simplistic elegance utilizing natural wood and stone finishes. 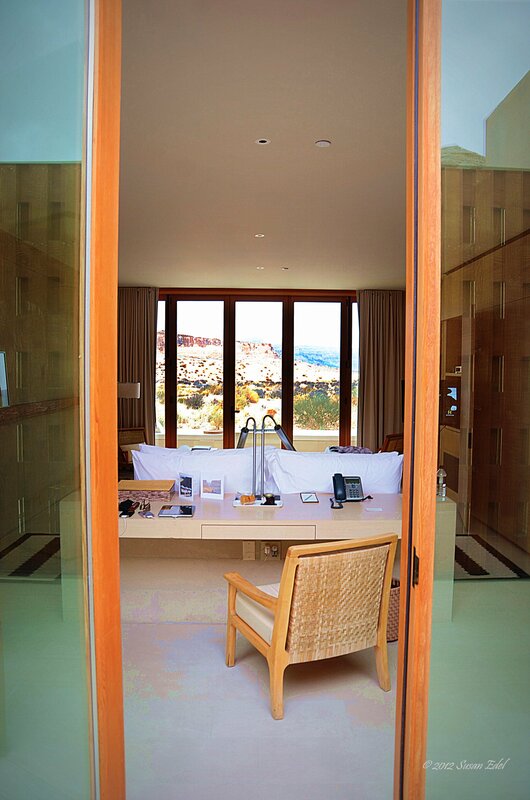 Each room has its own private entrance and patio. Once you enter into the private courtyard, you are looking directly through two end-to-end glass walls facing directly out towards the stunning landscape. The wall facing the outdoor patio opens up to the width of the room to create an amazing indoor/outdoor living experience. One of my favorite experiences was hanging out on the patio each night by the fire pit, laying on the cushioned sitting bed staring at the zillions of stars in the sky. As an added perk, the mini-bar is complimentary and although this resort is seemingly so remote, each room offers all the modern conveniences you could need. 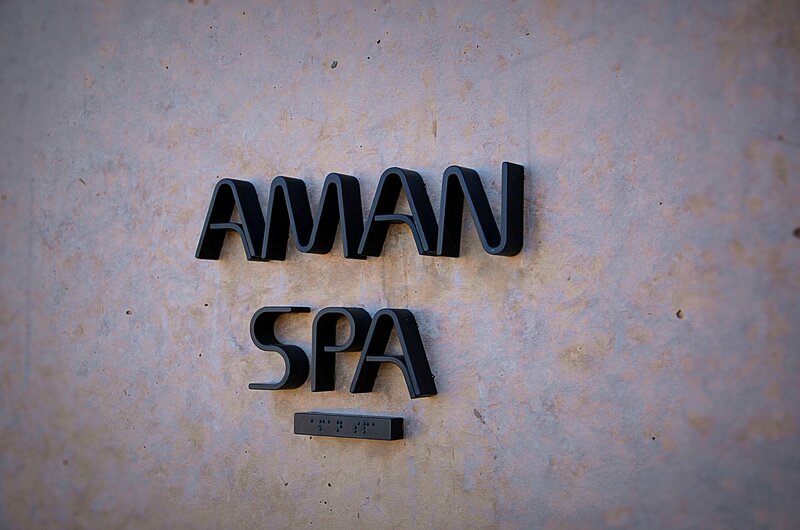 If you’re looking to get your Zen on, then you’ve come to the right place. This full-service spa is almost a spiritual experience. As you enter through a large cast-iron door, you step into a dimly, candle lit room and you almost immediately start to feel your stress melt away. Nothing is ordinary about this spa. 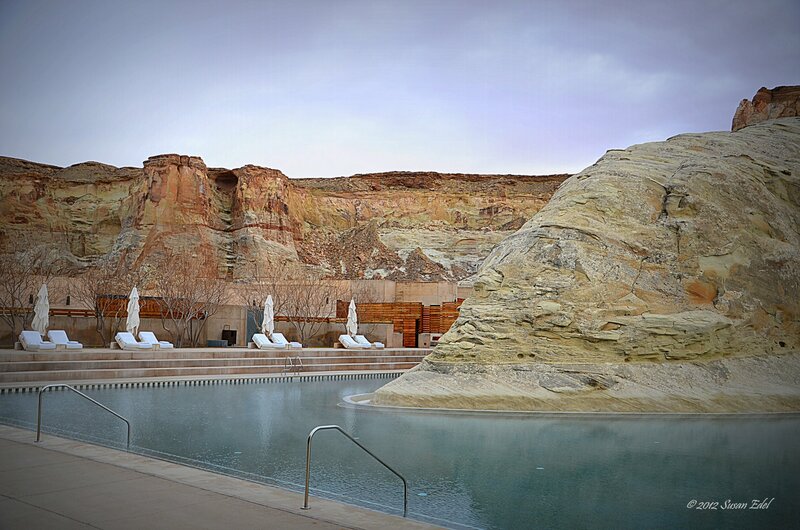 From the treatments which reflect the elements of the Navajo culture to the stone-lined soaking pool and outdoor treatment rooms with desert views, each experience engages your senses and transcends you to a complete place of relaxation. All guests are invited to use the Water Pavilion’s steam room, dry sauna and cold plunge pool. Breakfast, lunch and dinner is served in the dining room with its floor to ceiling glass walls overlooking both the expansive desert views on one side and the resort focal point of the pool built around a beautiful, indigenous rock. The resort dining experience evokes an intimate feeling that is reminiscent of dining in a private residence. On my first night at the resort I was not aware of this concept and at first waited to be seated, then I was informed to sit wherever I chose. After the meal, I kept waiting for my waiter to bring me the bill and yet it never came. When I finally inquired about it, I was told there is no bill ~ now wait, that doesn’t mean you’re not being billed for it, it just means you don’t get a physical bill at the table. Some people may like this concept and others may not as you are not immediately seeing what you are being charged for. I actually enjoyed the fact that I could just leave the table when I was done. Due to the fact that this resort is so remote, it’s not as if you can just hop in the car and head out to another restaurant for the evening. So the majority or all of your meals will be eaten here. The restaurant tries to vary the menu as much as they can, but I did find it a bit repetitive and limiting after four days at the resort. Having said that, they are very accommodating in offering to make any dish you request assuming they have the ingredients to make it. The crowned jewel at this resort is the pool. After seeing a photograph of it in a travel magazine, it was the catalyst that got me to seek out this resort and make my way to it. I had to see this extraordinary and unique pool first hand. It’s surreal and beautiful at first sight. The water flows around the rock in a horseshoe formation. The deck is surrounded by a beautiful rock wall infiltrated with all the beautiful colors of the earth showing through. The lounge chairs with their oversized cushions fold flat to make lounge beds. Quite decadent. Although you would come to a place like this for complete relaxation and rejuvenation, there is actually plenty to do here to keep you busy during the days. There are endless hiking trails throughout the property which you can explore on your own or take once of the guided hikes that the resort offers. Lake Powell and the city of Page are worth a day trip to check out the local sights such as Horseshoe Bend and more.The resort concierge can also arrange for more extravagant excursions such as hot-air ballooning, horseback riding and even a helicopter ride. A little trivia fact is that Hollywood has even come calling to this resort as some scenes from Broken Arrow with John Travolta and more recently the movie John Carter have been filmed here. Some prop shacks from Broken Arrow still stand on the property. Thanks for stopping by Andy. Yes, this place is so unique and amazing, it would be incredible for anyone to see it first-hand.